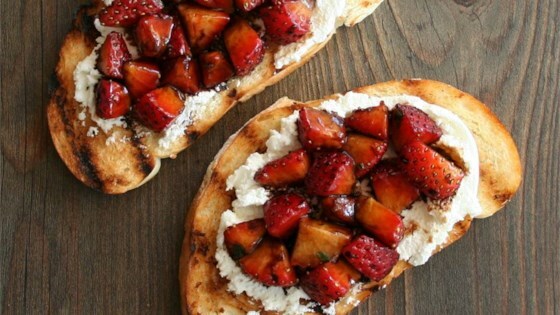 "The way the tangy, slightly salty goat cheese works with the syrupy, balsamic-coated strawberries and crispy, charred bread is a thing of beauty." Heat vinegar in a small skillet over medium-low heat. Simmer until reduced by about half, 8 to 10 minutes. Remove from heat and allow to cool to room temperature. Prepare a grill for high heat. Place bread slices on a foil-lined baking sheet and drizzle with olive oil. Grill bread on the preheated grill until browned, about 3 minutes per side. Spread goat cheese on toasted bread. Add black pepper, salt, and reduced vinegar to the strawberry mixture. Spoon over the goat cheese topped bruschetta. Garnish with additional thyme. A somewhat sweet, mostly savory, all delicious appetizer—or even dessert. You can toast the bread under the broiler instead of on a grill if needed. I have made this using basil instead of the thyme and its amazing!!! People always ask me for the recipe. Tastes fan-freakin'-tastic. The saucy cut-up fruit does not travel well. Wait til it's the last possible moment to mix it up. Good. I had some trouble reducing the vinegar, it turned hard fast. But the flavors came together well in the end. These are amazing!! We took the advice of another and used basil instead of thyme. My kids 12 & 7 ask for these daily and even the picky hubs likes them too. Thanks for the great recipe!